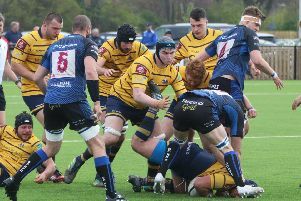 Jody Levett heaped praise on Worthing Raiders as a second half blitz saw them win their opening National 2 South home fixture of the season on Saturday. Raiders ran in ten tries - eight of which came after the restart - to rack up a crushing 68-21 bonus point triumph over Redruth at Roundstone Lane. Jack Maslen, Curtis Barnes and Matt McLean - reaching 100 National League tries - all went over twice while Jonathan Dawe, Joe Spurgeon Jack Forrest and Matt Walsh got in on the act as it turned out to be a crushing win for the home team. Raiders would have probably settled for any kind of victory having been locked level at 14-14 at the interval before running away with it after the restart. Worthing won 11 of their 15 matches at Roundstone Lane last term and head coach Levett is looking to better that this season. He said: “To score 68 points and eight tries in the second half is an outstanding effort for the players and was great entertainment for the supporters. We won 11 at home last year and are always striving for improvement, so we are one down 14 to go. Raiders started with successive away matches, losing on the opening day at much-fancied Taunton before bagging a first victory of the season over newly promoted Guernsey last time out. As good as the opening win of the campaign at Guernsey was, Levett was delighted to be back in front of the Worthing faithful. He added: “It was important having had two weeks on the road to start at home so positively in front of a very vocal home crowd. After winning two of their opening three matches this season, Raiders now head to Clifton sitting in fourth position. “They (Clifton) are always a strong team, especially at home,” Levett said. “It also depends on how many loan players they have from Bristol Bears. They have a very strong pack and arguably one of the best front rows, so it will be a tough day up front.